By William Mackay: For WBA light welterweight champion Amir Khan (25-1, 17 KO’s) to beat IBF champion Zab Judah (41-6, 28 KO’s) on July 23, Khan will have to be nearly perfect to come out on top. The reason why is that Judah is so much more skilled than the guys that Khan has been fighting up until now. The skills factor alone will be a daunting task for the young 24-year-old Khan because he doesn’t seem to fight with a lot of intelligence in the ring. Khan seems to get by with hand speed alone and with following the instructions of his trainer Freddie Roach to the letter. If you get Khan off of his game, by stepping in front of him while he’s doing his usual side to side movement, he runs out of ideas. The main problem that Khan has is that he has no inside game at all, period. We saw that in his close 12 round decision win over Marcos Maidana last December. 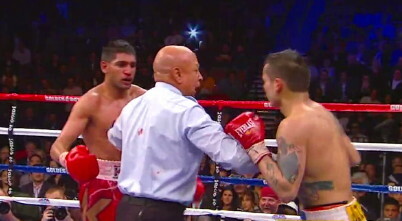 Whenever Maidana came inside to fight, Khan would either shove him hard, grab him in a clinch, grab him around the back of the neck or the referee Joe Cortez would break the action despite Maidana still throwing and landing shots. I don’t know what Khan will do if Judah tries to fight him in close other than the shoving and holding that Khan did in the Maidana bout. Cortez isn’t working this fight, so there likely won’t be too many breaks in the action on the inside if Judah is busy drilling Khan with shots. And if Khan fights like he did against Paul McCloskey where Khan misses over and over again with his punches, Judah will make a mess of Khan with his counter shots and big uppercuts. Khan really has to fight the perfect bout in order to beat Judah, because if he makes a mistake and tries to trade with Judah, I can see Khan getting knocked out quickly.